State College teenager Devin Adams skis Tussey Mountain in the winter. She surfs in the Atlantic Ocean in the summer. She’s an accomplished horseback rider who participates in state competitions. Just like any other middle schooler, she effortlessly navigates her iPhone to text with friends or share videos. The 13-year-old Adams also was born legally blind, and is one of an estimated 3,202 people who are “visually impaired” and living in Centre County. She’s also one of many who haven’t let their lack of vision affect how they live their lives. Adams, who can see colors and shapes, participates in programs such as the Sight-Loss Support Group (SLSG) of Central PA, which is designed to assist the blind. The organization provided support to 170 individuals during 2012-13. 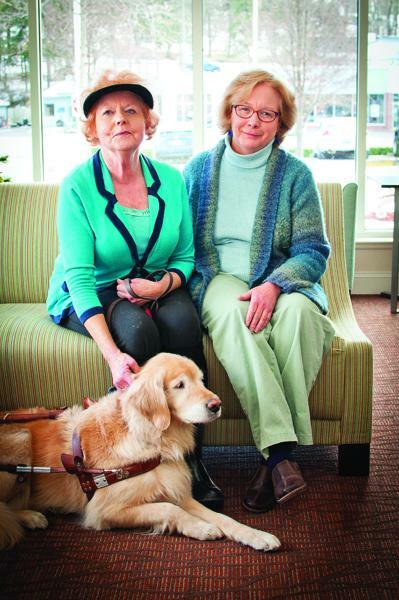 State College resident Rana McMurray Arnold founded SLSG due to a desire for individuals to know what is possible when faced with sight loss. “I wanted to help provide an opportunity and a resource for others so that they can gain confidence by knowing what is possible, and find the training they need to live more independently,” she says. There are a number of apps for smartphones, tablets, and other technologies that use voice commands to help people with sight loss live more independently. State College Area School District (SCASD) offers some early-learning opportunities. Adams, an eighth grader at Mount Nittany Middle School, meets with a SCASD teacher of the visually impaired who specializes in vision loss, orientation, and mobility. In elementary school, Adams was taught braille, how to navigate with her cane, and computer-access skills. Now that she is in middle school, she meets with the teacher only one to two times a week during her free period to go over certain areas of teaching. “This week she helped me to get clarification on the Nemeth Code for ‘greater and less than,’ ” she says. Nemeth Code is the braille code used for mathematics. Adams needs to know how to read and write in braille and in Nemeth Code in order to translate her work on the computer so that her teachers can grade her work in print. Adams belongs to the choir at school and plays the clarinet in band, but says that her favorite place to be is the barn. Ever since she was age six, she has taken horseback-riding lessons locally. “It’s a rewarding experience,” she says. As was her surfing in the Atlantic Ocean as part of the Indo Jax Surf School in North Carolina and its camp for blind children and their sighted siblings. Adams attended the camp last summer and is planning to attend again this summer. Michelle McManus, blind since birth, has lived in State College independently for more than a decade and works for Penn State as an information technology consultant teaching and testing accessibility for Web sites. She serves as president of the Happy Valley Chapter of the National Federation of the Blind (NFB). Growing up outside Memphis, everything was a far distance for McManus. State College offers a vibrant community where work and play is more accessible. She encountered a challenge recently, but it ended up a refresh- ing experience. She ascended the step of a CATA bus and didn’t realize it was one of the few older-model buses, which have three steps compared to just one step in the new buses. She tripped and she fell. Then she gathered herself and climbed the stairs. When the bus driver knew McManus was okay, he did something that truly amazed her. He said nothing — not a word. The causes of vision loss are varied. Some people can be born completely blind, and oth- ers deal with slowly worsening vision over their lifetimes. A majority of visual impairments can be avoided or cured with early detection. Being characterized as legally blind means that one can see 20 feet in front of them what a person with normal vision can see at 200 feet, or 20 degrees of peripheral vision or less. SLSG strongly believes that sight loss should never stand in the way of living a full life. Arnold, who was born in Chicago, with two degenerative eye diseases, could see only eyelash distance away as a child, but she could see brilliant and bright colors. “My parents created a kaleidoscope world for me, taking advantage of the Chicago Art Institute, Goodman Theater, symphonies, operas, and travel to Central and South America,” she says. “I learned very young that visual impairment does not equal cultural impairment. Arnold helped to start View Via Headphones, the live-audio description service used to help sight- impaired patrons more fully experience theater, musical, and dance productions — the first such service in Pennsylvania. Audio describers use equipment that transmits via radio signal to earphones of individuals in the audience. People with low vision will still be able to enjoy the exciting crackle of live performances and take in the atmosphere of a cultural event — the lights, sound, color, powerful voices, the hush of the crowd the moment the lights dim, and other aspects. Nanette Anslinger of Altoona coordinates the View Via Headphones program. She says that audio describers devote about 20 hours of time training and practicing for the role. People who appreciate the arts learn how to help narrate the action on stage with the goal of allowing low-vision individuals to make their own inferences of the production. The narrators clarify visual details and provide background information. It is a fine balance of using an expressive voice and not interfering with other significant audible elements of a performance. Another SLSG activity using this approach is Festival Eyes where people with sight loss can attend the Central Pennsylvania Festival of the Arts with a trained guide. They also schedule guided touch experiences at galleries, studios, and cultural and historical events. SLSG holds a monthly luncheon for people at different stages of sight loss to share experiences and support each other. The people at the lunch offer understanding and empathy. There are highs and lows in the room and all agree that humor is the best way to deal with frustrations that come with daily life and sight loss. In an effort to bring awareness to access and equality issues that blind people are dealing with, Penn State senior Zach Brubaker of Lancaster County organizes “Cane Walks” on campus where sighted and low-vision individuals practice skills together using white canes and sleep shades to enhance the simulation. The event is part of a university diversity program in partnership with the Penn State University Al- liance of the Blind and Sighted, which Brubaker, who was born legally blind, founded. He also serves as president of the Pennsylvania Associa- tion of Blind Students. He says that university student organizations to which he belongs offer other ways to support each other. “Blind students share ideas and tips on how to make life as a blind student ‘normal’ and stress free. We share our experiences to encourage others to achieve greatness,” he says. Successfully employed blind individuals — including lawyers, doctors, scientists, teachers, and business owners — strive to help others obtain their career dreams. “Most importantly, we put forth efforts to educate the sighted community about the abilities of blind people. Everyone can learn much and help others at the same time,” Brubaker says. Brubaker, who received a scholarship from the NFB, says that he and others have worked to pass legislation that will give blind people equal opportunities to succeed. They participated in the democratic process by working with Congressman Glenn Thompson supporting a bill they drafted calling for fair wages for workers with disabilities. The Fair Wages for Workers with Disabilities Act H.R. 831 is under review in committee. Under current law, certain employers can legally pay less than minimum wage to blind workers. “We got to witness the interworking of the floor of the House to see action on this bill,” Brubaker says. When he was young, Brubaker was told he should consider getting a job in a factory that does not pay fair wages. Now this mathematics and physics double-major student plans to start his career in the private sector and then finish graduate school to specialize in his field. He relies on his strong sense of leadership to blaze a bright trail for others who might face these prejudices. “With the proper training and opportunity, blind people can be as, or more, competitive than their sighted peers,” he says. One aspect he says that he wouldn’t change is the fact that he lives his life legally blind. Kerry Royer is a freelance writer and author. She recently relocated to the State College area from Mount Gretna.